:Come On Over! (COO!) 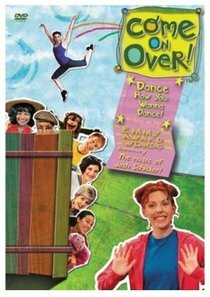 is an Emmy Award-winning musical comedy for kids and families that models creative play. The 23-minute episodes follow Joel and his quirky friends as they play through all sorts of situations. Joel is an artist whose art studio and backyard act as the primary setting to burst into music videos, whimsical make-believe, hands-on arts based projects and a whole range of silliness. All the while COO! models healthy choices and family values. Regular friends bring enthusiasm (Brandy), encouragement (Grandma Zippy), smarts (Hedge), and even skepticism (Mr. Flabbinjaw). As needed, a range of experts ?come on over? to play through dance or theatre or rock-n-roll guitar. Anything can happen through play: mad scientists, giant tinfoil spaceships, Bubble-ologists, flying hedgehogs and more!The themes of COO! are enhanced by faith-building activities that are a part of the DVD booklet. These materials include fun discussion points, games, and scripture that encourage families to play and pray together. About "Come on Over: Dance How You Want to Dance"